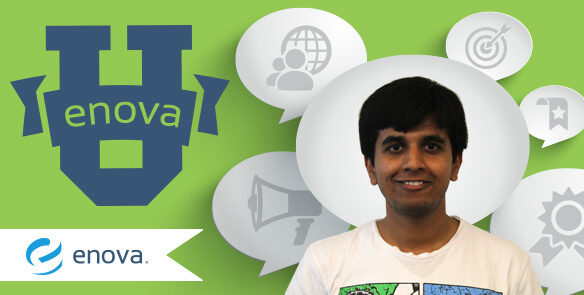 Interning at Enova: Software Engineering - Enova International, Inc.
Hi! I’m Pranav Moktali and I’m studying for my Master’s in Computer Science at University of Illinois at Urbana-Champaign. I’m one among seven Software Engineering Interns at Enova. I have learned so many new things in the last few weeks at Enova. It’s not just a Rails shop —people are working on different technologies, languages, Go, Ember.js and the mighty C++. This is because one of our core values is, “Best Answer Wins,” which means we always pick best solutions by working together. So far I’ve learned and strengthened my Rails skills with LevelUp. I have worked on the NetCredit web app for a couple of weeks and learned new concepts about Search Engine Optimization (SEO). I’ve also worked on a capstone project with fellow interns where we get to play with React.js. It’s been amazing thus far! Chicago is a very bike friendly city. I live only a couple of miles away and bike to work daily. It’s nice to see that we have a dedicated bike parking area in the building. One of my favorite bike paths in Chicago is the Lakefront trail along Lake Michigan. It begins at Navy Pier and goes on for miles and miles. I recently heard that you could also bike to Indiana! According to me, biking along lakefront trail is one of the best ways to see the Chicago Skyline. That’s it for now, gotta go back and debug my code!